Fish tacos with a spicy creamy chipotle aioli. 1. This might seem un-characteristic, given my general healthy habits but I love mayo. And I have an unhealthy addiction to Japanese Kewpie Mayo. If I had to choose 5 things to bring to a desert island, that just might be one of them. Along with a few chipotles to make this sauce. 2. I made these tacos all for myself one night last week while Jack worked late… catching up on my guiltiest of guilty tv shows… The Bachelor, which I had proudly avoided for weeks… and Smash, a show I hate that I love. (Or love to hate, I’m not sure which). 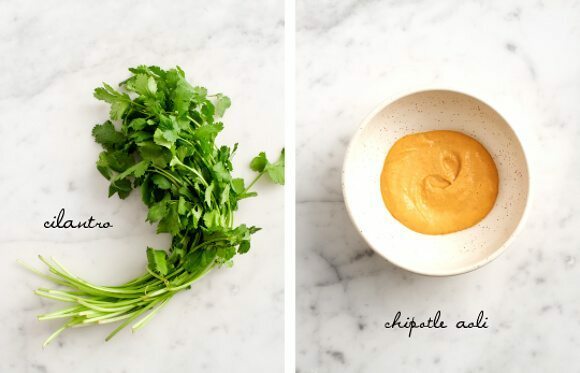 Combine all ingredients for the chipotle sauce in a food processor. Taste and adjust seasonings to your liking. 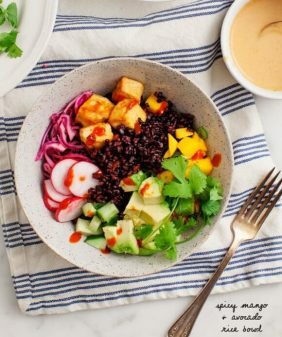 You may want to add more chipotle peppers for more flavor/spice, more mayo to make it richer, or more tofu to mellow it out. Chill until ready to serve. Season the raw shrimp with salt and pepper. Heat oil in a skillet over med-high heat. When the oil is starting to bubble, add shrimp and cook for about 2 minutes per side. When the shrimp is almost done, add the minced garlic and give the pan a good shake (I find that my garlic burns if I add it earlier). Add a few squeezes of lime and remove shrimp from the pan. 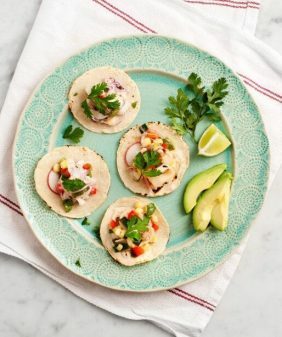 Assemble tacos with shrimp, raw veggies, spoonfuls of the chipotle sauce, and extra limes. By the way your social media buttons aren’t working on the sidebar! Favorite. Foods. Ever. And. Ever. Sigh. I hate/love the Bachelor. I gave up on it for so many seasons but I was sucked back in by some of my friends. I love anything chipotle, so you sold me on this recipe quite instantly! I shamelessly love mayo and shamefully love to watch The Bachelor. Tierra’s sparkle and eyebrow were so entertaining. These tacos sound delightful. Gorgeous. Craving these for lunch! i always use sprouted tortillas, but after i heat them they crack and fall apart a bit. the tortillas here look amazing! where might i find them..? After being in LA in January, we stopped by an amazing Taco place right at Santa Monica Beach, and had the most amazing shrimp Tacos…I salivate just at the memory!! you have inspired me with this dish to try it for dinner tomorrow night…thank you. 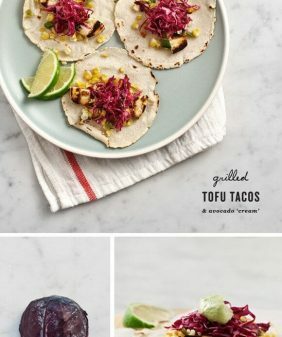 I love the simplicity of these tacos! I’ve been sick and just got my apetite back and could probably down about 6 of these myself. Definitely pinning these! The kewpie mayo is sooo good! If only it were more available! Made this the other night. So so so so tasty and easy. 3 shrimp/taco didn’t do it for us though – more like 5-6! I loved the radishes – such a nice, fresh crunch. And chipotle? Crack. Keep it up! 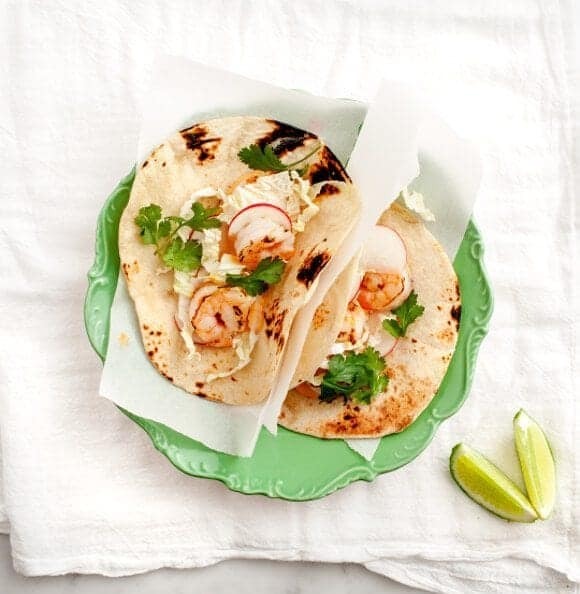 Now I am craving some veggie tacos (love the shrimp, but i’m allergic) with a margarita… and chipotle. What an amazing combo! we in the south swear by Duke’s mayo. it’s the most ‘real’ tasting you can get i think, and essential for all the egg salad i’m now making from my chicken gals eggs. oh boy, can NOT get on board with the bachelor but I, too, HATE how much I LOVE Smash! These tacos (+ a blood orange marg) may have to be next week’s dinner in honor of Smash. 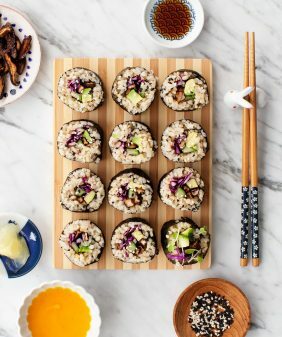 Have you ever tried making the aoli without the tofu? Is there anything I can use in its place to flavor/ mello out the aoli? Looks so yummy! 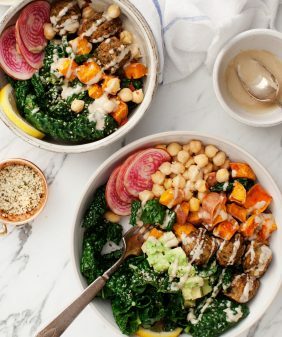 Love your idea of using radishes. Wow! These were wonderful! 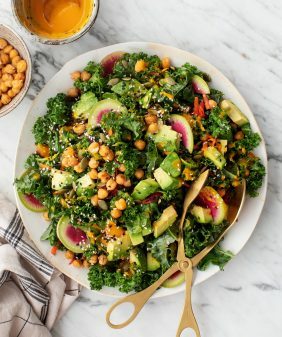 Easy to make – great for lunch! Made the sauce without the tofu….very spicy!